A coral reef is a delicate living ecosystem made up of a diverse combination of species. As a result of rising global temperatures, coral bleaching is threatening their very existence. It is these diverse species interacting together that create this unique and physical environment. With the sun as its energy source, through photosynthesis light energy is converted into chemical energy. Plants, algae and plankton are the building blocks in this complex and rich environment. 25% of the worlds fish species are housed within our reefs, as many as 750 different coral species on one reef alone, along with algae, marine worms, sponges, crustaceans, sea stars, snails and mussels and much more. Coral bleaching occurs when rising water temperatures cause the coral to expel the algae that is living in its tissues. This leads to the bleaching effect as the coral turns white. Changes in conditions affecting light and nutrients can also have this affect. It has been recorded that a substantial drop in temperature can also lead to coral bleaching. This was recorded in 2010 off the Florida Keys when temperatures dropped 12.06 deg Fahrenheit lower than normal January conditions. Coral Reefs have the ability to regenerate should they ever be damaged by storms or any other naturally occurring event. However as the ocean changes as a result of warming and acidification, we see an increase in coral bleaching threatening oceans reefs. As a result it becomes more difficult for coral reefs to recover. Professor Ove Hoegh-Guldberg talks more about this issue in a series of Seaview Science videos. Sodwana Bay, located within the iSimangaliso Wetland Park, boasts the southern most reefs in the world, and arguably some of the best diving sites for day and night diving. South Africa’s premier dive destination has largely managed to avoid any large scale effects of coral bleaching. South African coral reefs are not formed by typical biogenic accretion, but rather form a thin veneer on Pleistocene sandstone. Although not accretive, the coral reefs of South Africa are rich in biodiversity for a high-latitude community. It was therefore suggested that South African reefs can be considered as potential refugia (areas in which a population of organisms can survive through a period of unfavourable conditions) from climate change. However, in 2005 a warm-water anomalous event resulted in moderate, but for the region unprecedented bleaching on South African reefs. An in depth study is underway on the possible reduced risk of bleaching due to localised oceanic conditions. 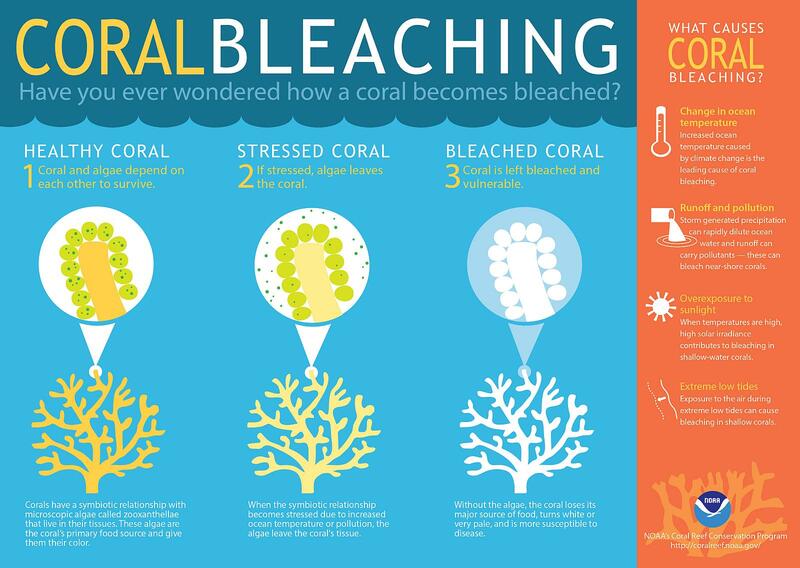 Have you had first hand experience of seeing coral bleaching? Perhaps you’ve dived a coral reef that has been affected, seeing the devastation it causes. Let us know what emotions you felt, what feelings or memories that evoked in you. Do you have a newsletter, or Facebook page?